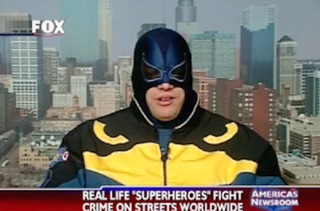 They walk among us—average citizens who don capes and masks at night to battle evil-doers. They call themselves Real Life Superheroes, and they are, of course, deeply nerdy. A visit to the World Superhero Registry - the apparent home of this movement on the web - reveals images of adult men and women in full-on superhero garb with invented monikers like "Death's Head Moth", "Master Legend" and "Dark Guardian". Their mission? To rid the city of crime and help those in need. Honorable goals, but they seem to be most successful at taking themselves waayyy too seriously and confusing the hell out of the criminals they encounter. Dark Guardian, for example - whose only superpower seems to be his heavy Staten Island accent - records an encounter where he attempts to chase a hulking drug dealer out of Washington Square Park. When it is revealed that Dark Guardian isn't actually a cop nor does he possess any sort of legal authority to tell the guy to move, things get kinddaaaa awkward. It's like he's just come to the stunned realization that he can't shoot laser beams out of his eyes, and the drug dealer, towering over Dark Guardian, feels too bad for him to even bother roughing him up. Then there's Shadow Hare, a 21-year-old whose intimidating Venom-style getup is belied by some B-roll footage of our hero flouncing down a fire escape. Such is the problem for real life superheroes: life is just a little too real sometimes to pull off wearing tights. "Citizen Prime" spent $4,000 on his custom body armor suit - and spends most of the time wearing it doing common household chores like watering the lawn and vacuuming. He lives in a pretty quiet neighborhood, which reveals itself to be another obstacle for our real life superheroes. It's sad and hilarious and kind of touching. I suppose they're heroes, in a way. They're not exactly rescuing people from burning buildings... but they are wearing capes. And that's gotta count for something, right?